003115Q Model RS York Landscape Rake Cat 1 Quick Hitch 5 Ft.
003116Q York RS Series Landscape Rake Quick Hitch Cat 1 6 Ft.
5438 York SSF Skid Steer Mount Landscape Rake Heavy 8 Ft. 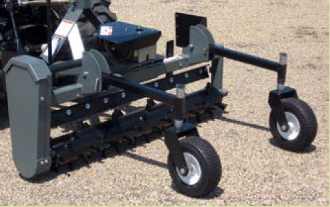 The 25 series models are designed for mounting on tractors from 25 to 40 hp with a category 1 three point hitch. Adjustable material bar (if debris is larger than the opening below the shield between the roller and the shield, it will get pulverized until small enough to pass through the opening, if the debris is rocks, you can drag them to the end of the row and then deposit them outside the cultivated area. Standard teeth on roller are Carbide aggressor type; teeth on the ST models are 2 inch long Sabre Tooth style (composite metal tooth).